During the three months since #3DBenchy first set sail, countless 3D printer operators around the world have produced a large fleet of tiny 3D-printed boats in a variety of layer heights, sizes, materials and colours. The initial 3D data for #3DBenchy was released as a single STL file and therefore only monochromatic #3DBenchy boats where made. We want to change this and give everyone the opportunity to push the boundaries of 3D printing in different colours and materials. Today we release a new version of #3DBenchy made of several parts. 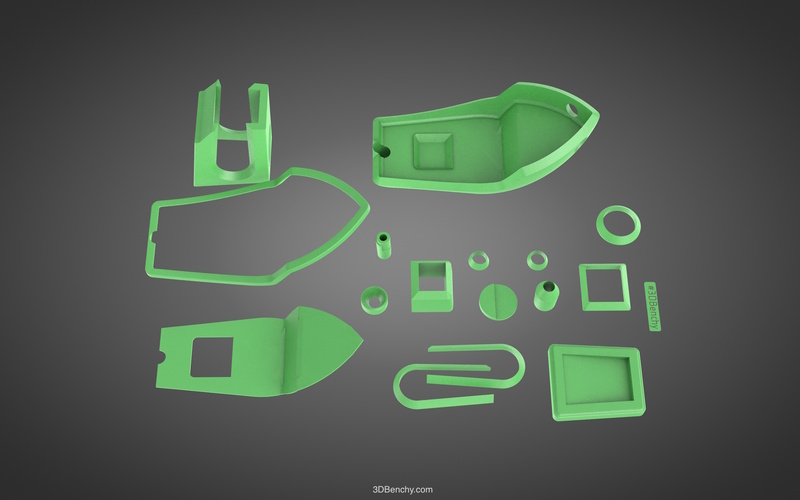 This multi-part assembly is separated into the seventeen different STL files as listed below, one for each specific shape feature of the #3DBenchy boat. Since most multi-colour 3D printers out there have two printheads, we make it easier to 3D print two different colours (or materials) by providing a pair of STL files containing the combined shells of two sets of boat features. Each feature “floats in the air” and both files fit together perfectly if they are positioned on the same XYZ origin in a 3D-printing slicing software. For anyone who has a 3D printer with more than two printheads, or if any given combination of colouring is desired – all the individual seventeen STL files can be handled individually in a slicing software. Remember that each STL file needs to be placed in the software at 0,0,0 in the XYZ-space to ensure that the geometries are positioned correctly in relation to each other. The basic process is to import two or more STL files into a 3D-printing slicing software and assign which specific printhead is used for each individual STL file. The slicing software then creates layers with paths and shapes for each correspondent feature and colour. This is currently the most common method for colour 3D printing in regard to extrusion-based 3D printers. Other methods such as filament-colour-sequencing and colour-blending also exist but are still in experimental stages and not widely available. 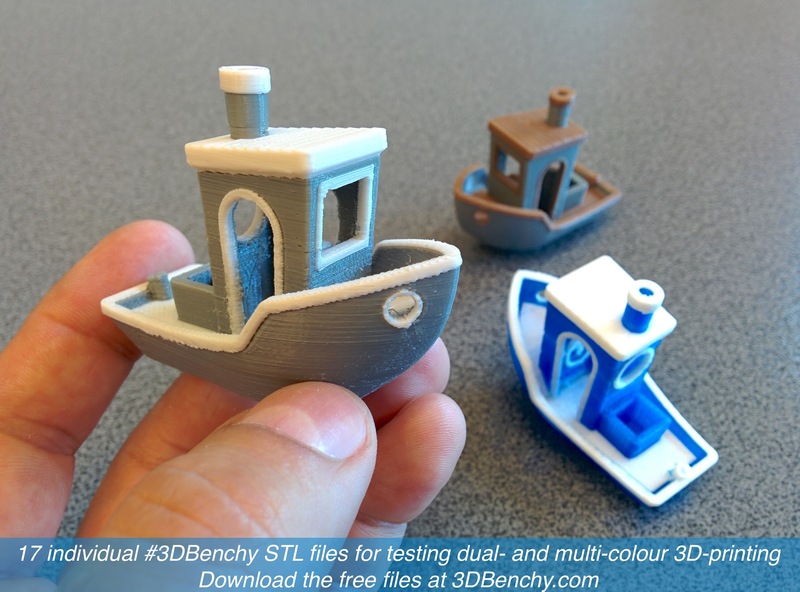 The STL files in this #3DBenchy release are suited for solid-colour printing, meaning that the volume in each file can only be filled with a single solid colour. The number of different colours is usually defined by the number of printheads. Historically, 3D printing i colour has been around since the 1990:s at the Massachusetts Institute of Technology where ink-jet technology was used to solidify gypsum in powder-based 3D printers. By using printheads to apply binder solutions in Cyan, Yellow, Magenta, Black and Clear, full-colour 3D printing was achieved. These 3D printers where introduced to the market as the Z Corporation ZPrinter model range, and are still today popular amongst applications for creating scale models for architecture, decorative objects, statuettes, etc. In recent years Mcor Technologies has developed a similar method for ink-jet colouring 3D prints using sheets of paper as the medium for creating objects. The 3D data necessary for such colour 3D printing is similarly to the STL file format, based on triangles, but is also accompanied by colour data in form of a pixel-based image. In other words this file format combines the colour information in an image, projecting it onto the surface of the triangle-based 3D-mesh. By definition the colour data in such files only resides on the surface of the object. Common 3D file formats for texture-based 3D printing are .obj, .3ds, .wrml accompanied by pixel-based files such as .jpg, .png, .bmp, etc. 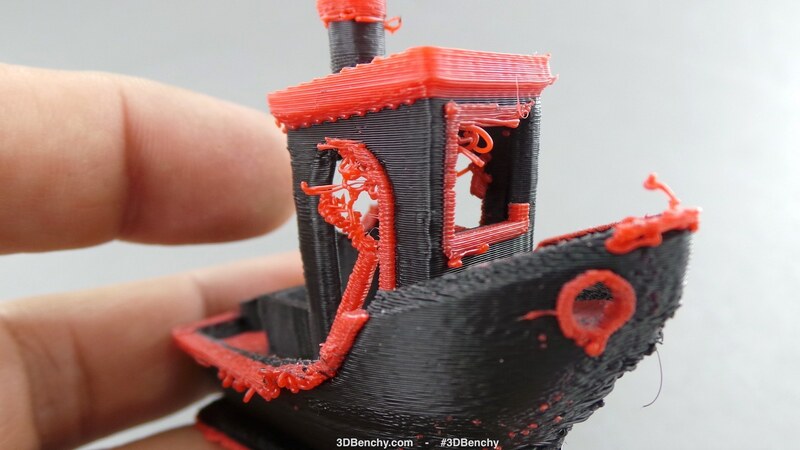 To further improve the usage of the #3DBenchy as a tool for testing 3D printers, we will soon release a high resolution texture-based version of the boat. Stay tuned for information when we release this. Give it a try and experiment! 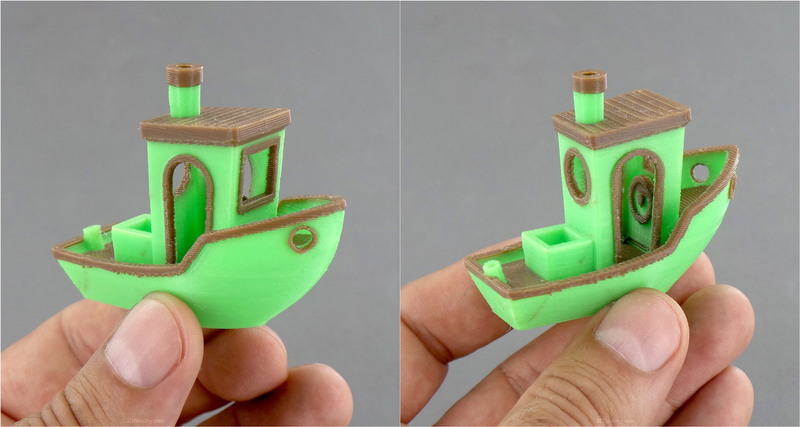 Regardless if you have a colour-3D-printer or not, feel free to experiment in other ways to colourise a #3DBenchy. For instance one could 3D print all parts individually in different colours and then glue them together. And naturally the most obvious and artistic way is to 3D print #3DBenchy in a neutral colour and then paint it by hand. 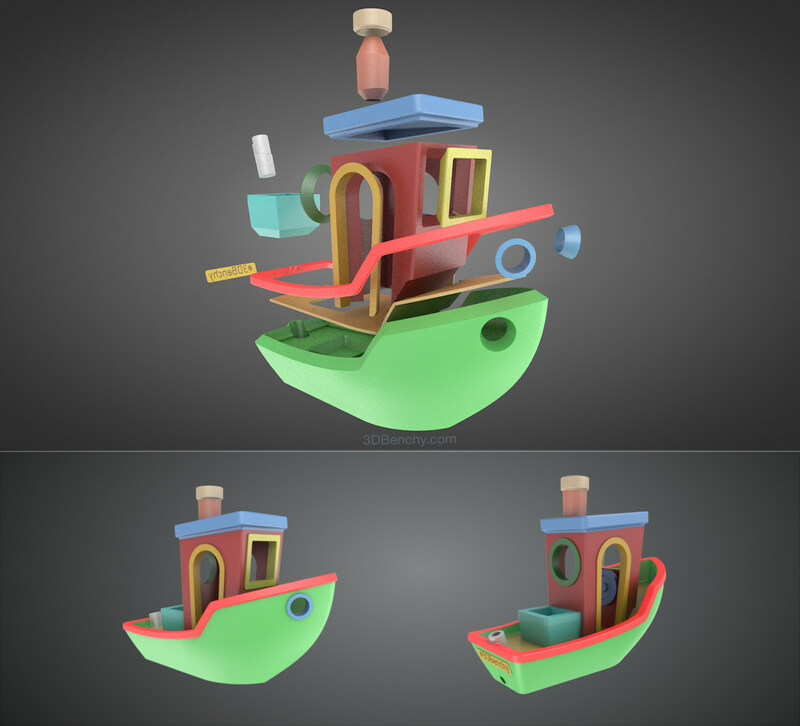 Whatever method you use to create your coloured #3DBenchy boats, please don’t forget to share the result with other 3D printing enthusiasts. Different slicing software solutions and multi-printhead 3D printers will yield varying results. Feel free to experiment and make changes to the settings to improve your 3D prints. Our recommendation is to change one setting at a time between each print. Take pictures and notes and analyse how the changes in the software affect the result. We have made many attempts and will continue to make changes to improve the multi-colour #3DBenchy prints. Check out this album with some images of our tests. Being able to print the smallest components, such as the hawsepipe, nameplate, etc. 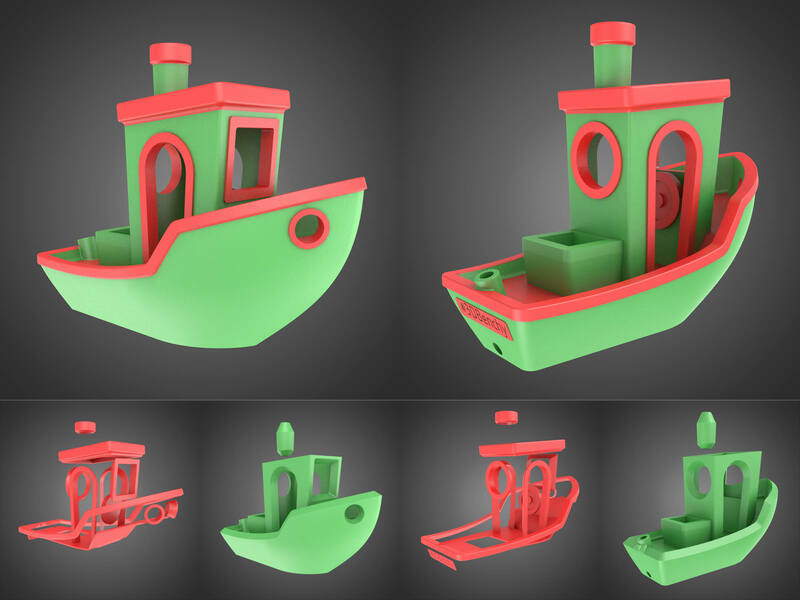 All the files for this version of #3DBenchy can be downloaded from the usual repositories. The data is released under a Creative Commons Attribution-NoDerivatives 4.0 International License. Please follow this link to start downloading. The best way to stay tuned and get the latest news from the #3DBenchy project is to follow on social media and subscribe to the newsletter.